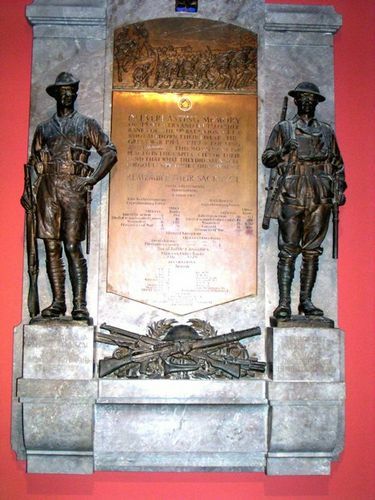 The memorial commissioned by the 9th Battalion (AIF) Association was mounted in the Crypt and unveiled by the Governor-General Lord Gowrie on 18 August 1937, commemorating the battalion's 45 officers and 1048 other ranks who lost their lives in World War One. It was created by former Brisbane sculptor W. Leslie Bowles at a cost of 500 pounds ($1000). Bowles was noted for his memorial work, having been head sculptor at the Australian War Memorial in Canberra during the years 1924 to 1931. In his speech at the unveiling, Lord Gowrie said " We arm so that we may be in a position to use our influence in the cause of peace, for it is obvious to us all that the peace of the world and the future of civilisation depends more than ever on the strength and unity of the British Empire". Morning Bulletin (Rockhampton), 19th August 1937. Ranks Of The 9th Battalion A.I.F.